Once in a while, we make something that calls for lots of egg yolks (such as Brazilian quinin or chocolate cream pie), and we end up with a bunch of extra egg whites. 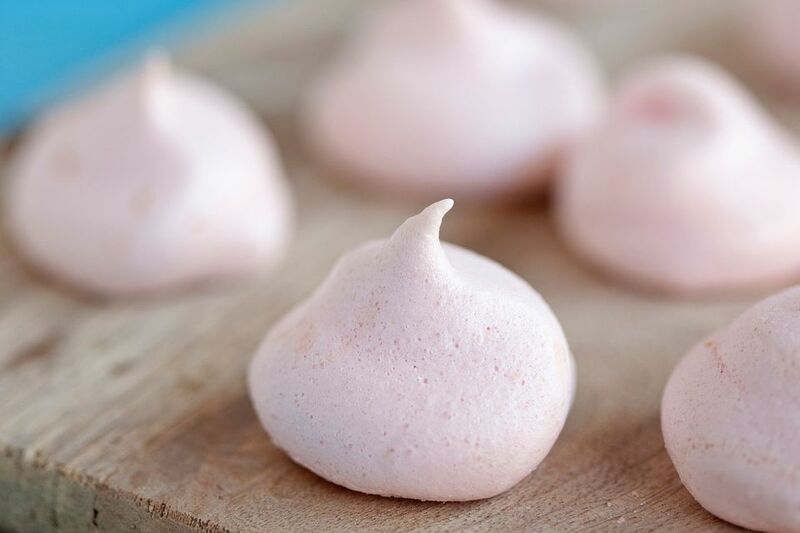 These easy meringue cookies are a great solution to that problem. Crispy and light, they melt in your mouth with a little "sigh" of sweetness (hence their name suspiro, or sigh). These cookies are flavored with vanilla, but you can add other flavorings (like in these peppermint suspiros), or fold in extras like ground nuts or mini chocolate chips. You can also use food coloring to give them pretty pastel colors, like French macaron cookies. This is also an excellent recipe to bake in toy ovens such as the Easy Bake Oven - since meringues cook best at low temperatures. These cookies store well in an airtight container, but they will quickly become chewy and lose their crispness in a humid environment. Place the egg whites and the cream of tartar in the bowl of a standing mixer. The bowl should be very clean, with no residual oil or fat, which could inhibit the formation of the meringue. Beat the egg whites (using the whisk attachment) until the egg whites form soft peaks. Gradually dd the granulated sugar, while still beating the egg whites. Continue to beat the egg whites until they have increased in volume and are forming stiff peaks. Sift the powdered sugar together with the salt, then add gradually to the egg whites, continuing to beat, until well mixed. Gently fold the vanilla into the meringue. Preheat the oven to 200 F. Line two cookie sheets with parchment paper. Tint the meringue with several drops of food coloring if desired. Fit a piping bag with a large star tip, and fill the bag with the meringue. Pipe the meringue into small swirls onto the parchment-lined cookie sheets, spacing them about 1/2 inch apart. Top cookies with a few sprinkles, if desired. Place the cookies in the oven and bake for 60 to 90 minutes, checking after an hour to see if cookies feel dry and crispy. Once the cookies feel firm and crisp, turn off the oven and let cookies cool while further drying out in the oven for at least an hour or two, or overnight. Serve cookies immediately or store them in an airtight container. Cookies will not stay crispy in a humid environment. What, Exactly, Is a Tasty Chilean "Underwear" Cookie?